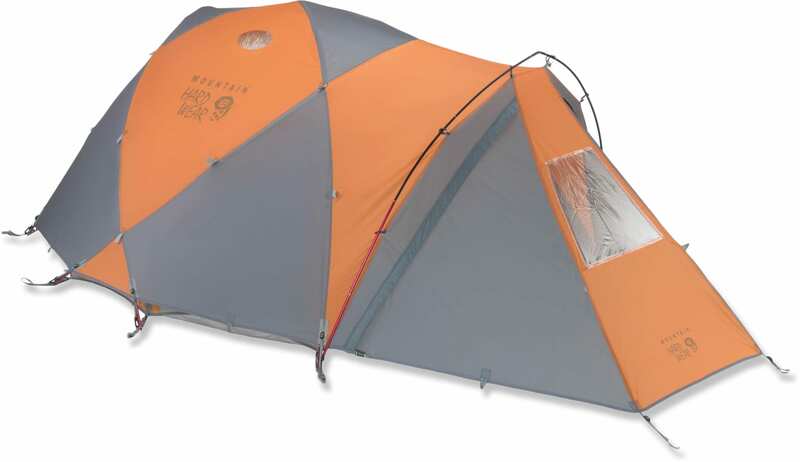 Mountain Hardwear Trango 2, a tent that really is built to be bombproof. The Trango is not exactly light, nor is it compact, but it is tough and roomy and makes a great first mountaineering tent that will see you through a long career of climbing. The Trango shares some of the features of its more sophisticated (and much lighter) sibling, the Mountain Hardwear EV2. It uses similar technology poles made from Scandium, a high-strength, low-weight alloy. The system is pretty easy to pitch and the fact that it has four poles makes for a really stable frame that keeps its shape and holds its tension nicely, even in a strong wind. If the space inside the tent doesn’t impress you (it has a claimed floor area of 3.8 square meters compared with 2.9 on the EV2) it also has a great vestibule for cooking and storing gear. What’s more this is a proper vestibule that is sealed off from the main body. When Ed Viesturs draw up the specs that were used to design the EV2 he wanted an integral vestibule, but most people don’t. It also has all of the bells and whistles that you would expect on this sort of tent. I’m talking about reflective guys and zipper pullers so you can find your way home at night, as well as nice big windows. What don’t we like about the Trango 2? All tent design is a trade between different priorities. I mean we would all like tents that are strong, cheap, roomy, waterproof and light. In truth we are lucky to get just a few of those. In this case you are paying in weight. The Trango tips the scales at about 4 kilograms. Now that is not too much, as tents go, but it is a good deal more than the 2.3 kg of the EV2). For less demanding conditions you can pack light. The tent go into a “superlight” mode in which you essentially just sleep under the fly sheet letting you shave about 1kg off its weight. But you wouldn’t want to do that too often. If you want to you’ll have to buy a separate ground sheet (footprint, in the jargon). And if you are shopping for accessories you can also get some little gear stowage bags that clip in. These are great for keeping headlamps or glasses off the floor. I don’t quite understand why gear companies can’t just throw them in as part of the package since selling them separately just makes them really expensive once the retailer has taken its cut. Some complaints we’ve heard are about condensation in the tent, but I think that a bit of moisture just goes with the territory. When you’re sleeping in a tent you breath or sweat about a litre of water over the course of a night. That vapour has to end up somewhere. A fair bit will get vented out but you have to expect that some will end up condensing on the inside of your fly sheet. There is also a much larger version of this that is known as the Mountain Hardwear Trango 4. It is, more or less, a sized up version of the 2 person tent with enough space for four. All in all you could do worse than getting a Mountain Hardwear Trango for your next trip to the mountains.